Almost 1.7 million people, or 4.9% of the Canadian population, identify themselves as a member of one of Canada’s three distinct groups of Indigenous peoples and cultures—Inuit, First Nations, and Métis. Of these, the over 630 First Nation communities are the largest and comprise more than 50 distinct nations and languages. 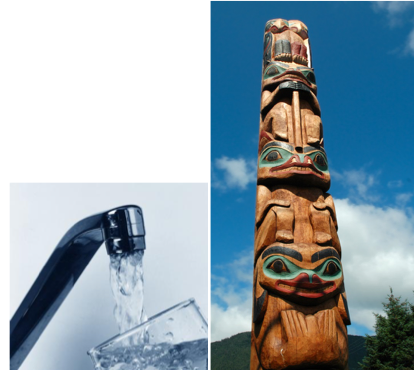 Management of drinking water quality for the First Nations is typically shared between individual communities and the Government of Canada. On reserves, Chiefs and Councils manage the day-to-day operations, including testing drinking water and issuing drinking water advisories (see box). Indigenous Services Canada (ISC) provides funding for First Nation water facility design and construction, operations and maintenance, and training and certifying operators. ISC also advises and supports drinking water quality monitoring programs. Despite Canada’s abundance of freshwater,1 many First Nation community members face a daily risk of illness from inadequately or untreated drinking water, which continues to make news across Canada. Just a few years ago, as much as 20% of Canada’s First Nation communities routinely had drinking water advisories, with some in place for decades. In 2015, Prime Minister Justin Trudeau and his party vowed to correct this disparity by March 2021. The federal and provincial governments of Canada are working with the First Nations to improve water infrastructure and quality on reserves, end long-term drinking water advisories on reserve lands, and prevent short-term advisories from becoming long-term. 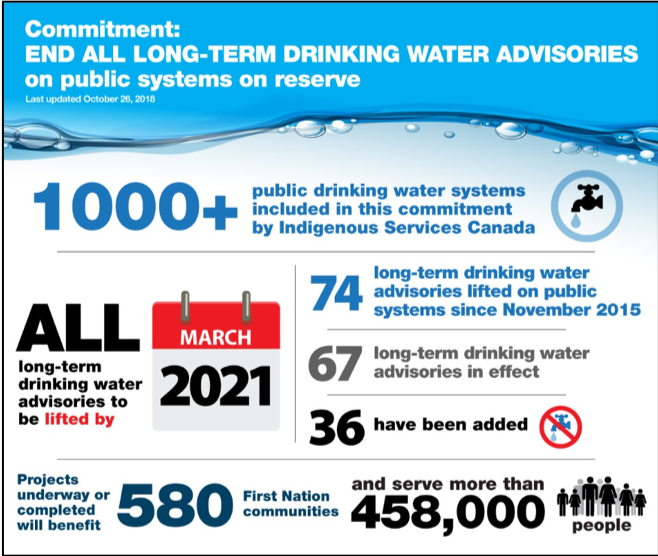 As 2018 draws to a close, hundreds of millions of Canadian dollars have already been spent and more pledged to address drinking water advisories and other water-related challenges for Indigenous communities, but many remain (see figure below). Drinking water advisories are issued based on water quality testing that indicates the water may be unsafe or is known not to be safe. An advisory may be posted for many reasons ranging from water line breaks to when communities do not have someone qualified to operate the system or anyone trained to test the drinking water quality. First Nations typically issue their own advisories, which can affect one building or an entire community. Some advisories are short-term; long-term advisories are those that have been in place for more than one year. There are three types: boil water advisories (the most common), do not consume advisories, and do not use advisories. To compare with DWAs in the United States, see Understanding Boil Water Advisories and Notices. These problems are often compounded by widespread distrust of the drinking water by many First Nation members. One recent study concluded that “Water treatment, monitoring and testing are ineffective if people do not believe that their water is safe to drink and are using alternative sources, such as bottled water, instead of that provided by the community.”2 For example, residents of Ontario’s third-largest First Nations reserve boil water, pay for delivery by truck, or haul jugs to and from the reserve’s two fill-up stations. All of which can be a financial or physical hardship—especially to the sick and elderly and particularly during the winter. In addition to climate-related challenges, the First Nations also face some unique obstacles. The typically remote locations of their reserves can make it difficult to supply existing drinking water treatment systems with chemicals, such as chlorine disinfectant, as well as filters and replacement parts. A particularly persistent challenge is attracting and retaining licensed operators to maintain, operate, and monitor equipment. Further, local geography, hydrology, and land use patterns affect raw water sources and quality dramatically, making a one-size-fits-all technological solution impossible. Among Canada’s 630+ reserves are numerous examples of failed water treatment plants and related infrastructure. Some systems were undersized, poorly designed, or both, while new or renovated treatment plants’ water lines often did not extend to every building on the reserve. For example, seasonal or longer-term disinfection byproduct-related advisories remain a problem for many First Nation communities that use chlorine disinfection of surface water sources, but with insufficient control of organic matter, such as from decaying leaves and other vegetation. Other projects failed prematurely because they were not properly maintained. This is a particular challenge in isolated reserves and during Canada’s demanding winters, which naturally grow more severe the farther north a First Nation or Inuit community is located. It is frequently necessary—but incredibly expensive—to deeply bury and maintain water pipes to preclude freezing and bursting pipes, which can still occur inside abandoned buildings or within hours of losing electricity. Some First Nation reserves, and particularly Inuit communities that rely on untreated lakes and ponds for drinking water, are at risk of uncommon waterborne pathogens such as hydatid (Echinococcus) tapeworms. Ingesting the eggs of these intestinal parasites—which are shed by voles, other rodents, and infected dogs—can cause serious illness. In addition, more common waterborne zoonotic pathogens like Giardia and Cryptosporidium parasites are often prevalent in otherwise pristine-looking waters. Fred M. Reiff, PE, is a retired official from both the US Public Health Service and the Pan American Health Organization, and lives in the Reno, Nevada area.